This week we were fortunate enough to attended the Decoded Fashion London Summit. Across the two day event we sat in on some really great discussions and talking points from various inspiring people within the fashion industry. The event itself is designed to bring together the biggest, most innovative and most disruptive fashion, retail and technology companies. It’s a way for each of them to connect, network and discover more about each other’s services whilst also getting the opportunity to hear from world-class fashion, retail and tech mentors and speakers. We were very thankful to be given access to the event as we found it to be an incredibly valuable experience, in particular the discussions surrounding personalisation of content, the influence of social media in fashion, as well as the future of luxury commerce. 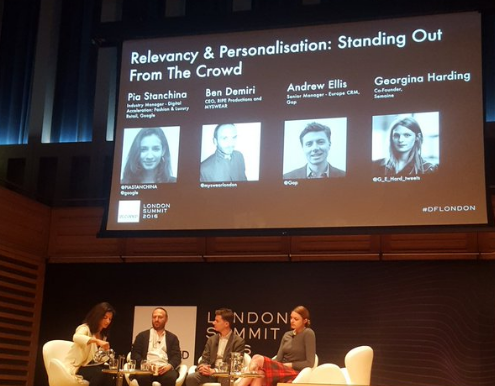 However, one panel that really stuck in our minds was around ‘Relevancy & Personalisation: Standing Out From The Crowd’, in which someone stated that 87% of consumers will pay up to 30% more for a personalised experience. We can absolutely believe this number, and as we are increasingly focused on personalising the online retail experience for the consumer through video, we hope we can begin to satisfy that 87%. Overall, the event was really insightful and we already can’t wait for the Decoded London Summit 2017!